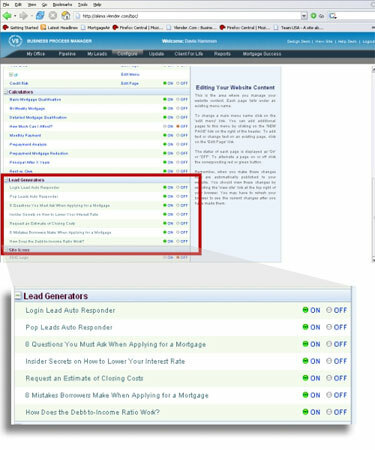 MyLeads a powerful marketing component of your Virtual Lender® website! You’d love to close more loans. And, you know that your Virtual Lender® website is an important component and you want it to be even more effective at lead generation. Information is one of the most effective tools for website lead generation or what is now being called “Demand Generation”. The most important thing to focus on is identifying what really matters to your visitors, what problems you solve for them, what benefits can you offer and what resources are available to meet their needs – basically what your prospects are demanding. 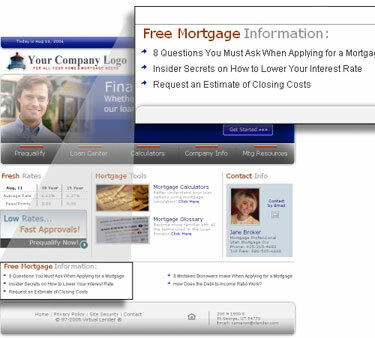 This feature upgrade adds a new area to your website home page called FREE MORTGAGE INFORMATION that lists several generalized “On Demand” reports for your prospective prospects to answer these points. When the prospect clicks on the link to one of the free reports they will be directed to a page on your website to request the report. This page contains a form that collects basic contact information that the potential prospect completes to view the report. After the prospect submits the form to request the report, they are then directed to the actual report download screen. They can then click on the report to download it and view it in a .PDF format. The prospect is immediately sent an email that includes the report and your contact information for future reference. This way they can see it on the screen immediately but also reference it later by checking their email. 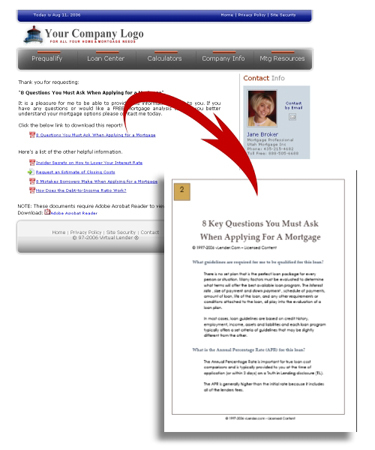 The prospect information is then sent via email to you for review as a lead. 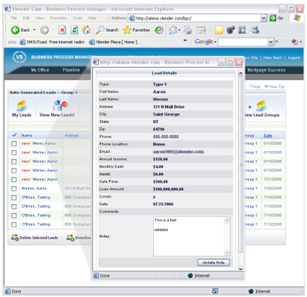 The prospect information is also listed in your new "My Leads" area located in your Business Process Manager. 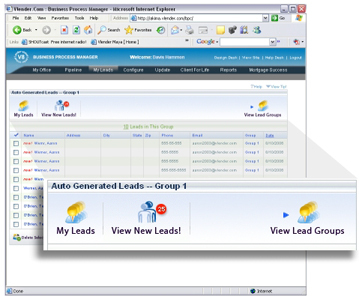 The My Leads area in the Business Process Manager gives you the ability to manage your leads. By clicking on any lead you can view the detailed information about the lead. You can also store notes and other information about the lead. 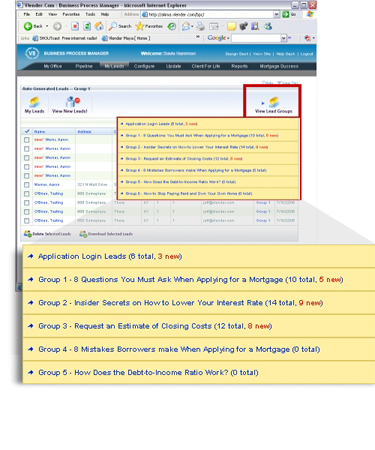 You can also sort leads according by the report type or source of the lead. These are called "Lead Groups". By clicking on the lead group icon you will be able to view individual data on the each lead group such as the number of leads old/new. You can turn any of the reports "On or Off" by visiting your configure area in your Business Process Manager. 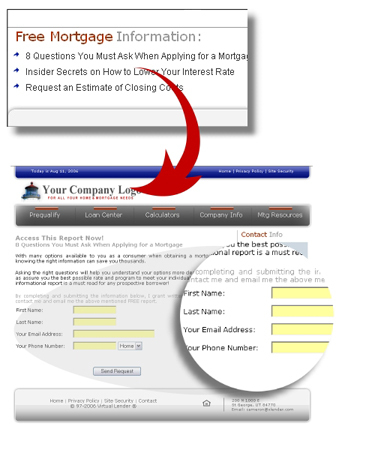 Simply click on the Manage Content Tab and scroll down to the area call "Lead Generation". You will see the list of available reports. When you turn a report "Off" it is no longer displayed on your website.